Explanation: For an Earth-orbiting gamma-ray telescope, Earth is actually the brightest source of gamma-rays, the most energetic form of light. Gamma-rays from Earth are produced when high energy particles, cosmic rays from space, crash into the atmosphere. While that interaction blocks harmful radiation from reaching the surface, those gamma-rays dominate in this remarkable Earth and sky view from the orbiting Fermi Gamma-ray Space Telescope's Large Area Telescope. The image was constructed using only observations made when the center of our Milky Way galaxy was near the zenith, directly above the Fermi satellite. The zenith is mapped to the center of the field. The Earth and points near the nadir, directly below the satellite, are mapped to the edges of the field resulting in an Earth and all-sky projection from Fermi's orbital perspective. The color scheme shows low intensities of gamma-rays as blue and high intensities as yellowish hues on a logarithmic scale. Our fair planet's brighter gamma-ray glow floods the edges of field, the high intensity yellow ring tracing Earth's limb. Gamma-ray sources in the sky along the relatively faint Milky Way stretch diagonally across the middle. 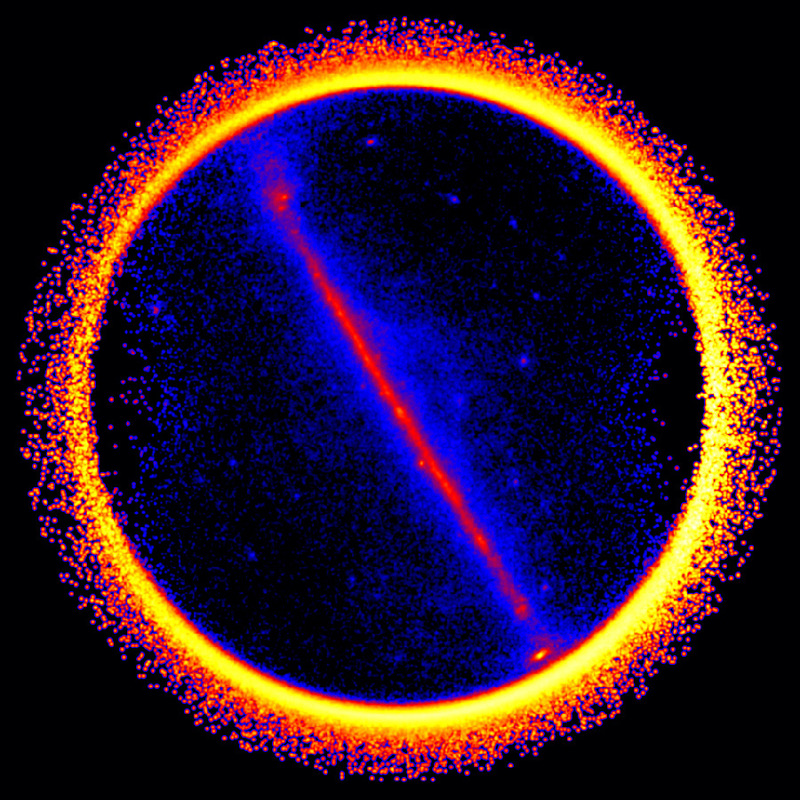 Launched June 11, 2008 to explore the high-energy Universe, this week Fermi celebrated its 2,000th day in low Earth orbit.